Sometimes, a band’s music registers just as seismically on an emotional wavelength as it does on a sonic spectrum. 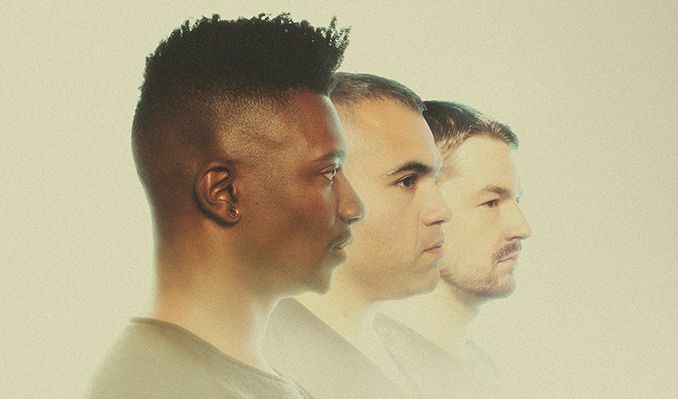 Animals As leaders—Tosin Abasi [guitar], Javier Reyes [guitar], and Matt Garstka [drums]—reimagine, reinterpret, and refresh instrumental prog, experimental metal, modern jazz, alternative, and even world music to a point where the reaction becomes primal on their fourth full-length album, The Madness of Many [Sumerian Records]. That’s why Animals As Leaders have risen to celebrated heroes of their respective instruments since first emerging in 2007. Most recently, 2014’s The Joy of Motion bowed at #24 on the Billboard Top 200, moving 13,000 copies first-week. Along the way, the trio has earned acclaim from the likes of Consequence of Sound, Revolver, Ultimate Guitar, and Rolling Stone who extolled them, “as satisfying in their visceral kick as they are in dazzling displays of dexterity.” Tosin would grace the cover of Guitar World twice, while Matt covered Modern Drummer. Consistently delivering a captivating show, they’ve toured alongside Deftones, Between The Buried And Me, Periphery, and many others in addition to Tosin joining Joe Satriani at the G4 Experience and Steve Vai and Nuno Bettencourt for the Generation Axe Tour. Matt remains a sought-after talent, performing on Late Night With Seth Meyers and at drum clinics and festivals worldwide, and Javier’s solo project Mestis stands out as a fan favorite. When it came time to begin working on new music in late 2015, the musicians possessed a clear vision for their next evolution. The band opened up the writing process like never before since Matt joining in 2012. Ideas were flowing freely, and his contributions added another dimension to the group’s signature style. Another first, Tosin and Javier actually wrote guitar to the drums of six-minute album opener “Arithmophobia.” It’s polyrhythmic percussive palette provided the perfect backdrop for distinct dexterous riffing and a hypnotic hummable lead. Meanwhile, single “The Brain Dance” begins with delicate acoustic guitars before morphing into a head-spinning tapestry of fret fireworks. Ultimately, The Madness of Many will impact listeners like only Animals As Leaders can.